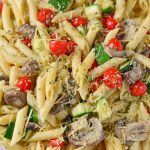 This Alaska Salmon Pasta with Lemon Garlic Butter Sauce goes from simple ingredients to a delicious and filling easy family dinner. 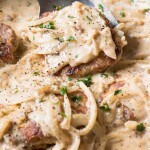 Baked Salmon with pasta and a delicious lemony and buttery garlic sauce! This post was sponsored by Alaska Seafood as part of an Influencer Activation for Influence Central and all opinions expressed in my post are my own. We only purchase Wild Alaska salmon in our home. I’ve read enough about farm-raised salmon to know that it’s not going to be on my dinner table. You cannot beat the delicious flavor from a fresh piece of wild caught Alaska salmon. My favorite way to eat Alaska salmon is with a starch. I’ve always had either rice or pasta with salmon. My mom madeAlaska salmon once a week, but she would make salmon steaks. She would make salmon pasta if we had leftovers and we always loved it so much. Now I just make it with fresh salmon, because in our house we never have leftover salmon, ha! I’m a salmon filet girl, and so is my family. We also it once a week because it’s extremely nutritious (omega 3s, vitamin D, selenium and more), when you know where it comes from. Alaska Seafood is always sustainable and wild caught. An impressive 60% of all wild seafood harvest from the U.S. comes from Alaska. They are the nations largest source of domestic seafood. Alaska salmon is 90% of the U.S. catch. I’m sharing one of our family favorite Alaska salmon recipes to celebrate Wild Alaska Salmon Day on August 10th! This is a super easy salmon dish that you can whip up in less than 30 minutes! 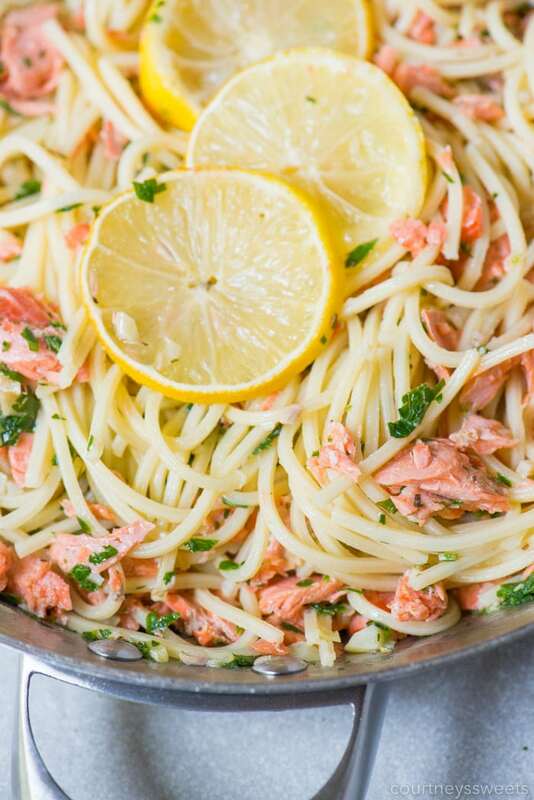 My husband would be happy if I made salmon with pasta this way every week, it’s hands down his favorite way to eat salmon. 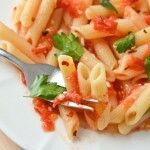 My daughter even begs for salmon pasta now, it’s definitely a family favorite recipe. That is it! You most likey have all of the ingredients and none of them are hard to find if not. If you have a frozen salmon you can also make this recipe, but follow baking instructions in our post on how to cook frozen salmon. 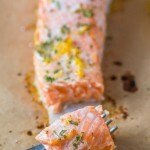 Line a baking sheet with parchment paper and then place down the salmon. 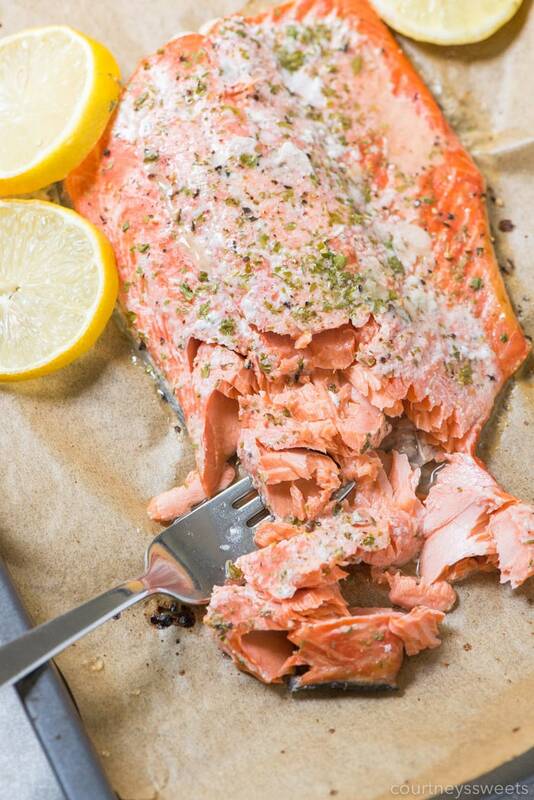 I love to use fresh lemon so I cut one in half and squeeze half right over the salmon. Then I slice the other half to place on the salmon after seasoning. 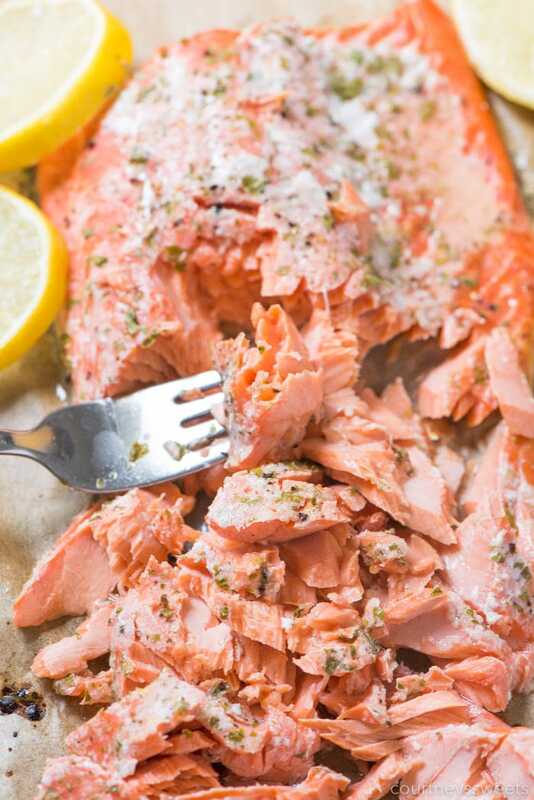 Lemon juice cooks seafood so it will cook the salmon so it will start to look a little whiteish, don’t worry it’s perfectly fine and will finish cooking in the oven. For this reason, do not marinate the salmon, instead cook it right away. I seasonAlaska salmon with granulated garlic, parsley, salt, and pepper. Then you’ll place into the oven and bake at 400 degrees F for about 12-15 minutes, or until the salmon reaches 145 degrees F when the temperature is taken in thickest part. While the salmon is cooking I start the pasta and garlic butter sauce. The garlic butter sauce is good enough on it’s own just pouring it right over theAlaska salmon, yum! 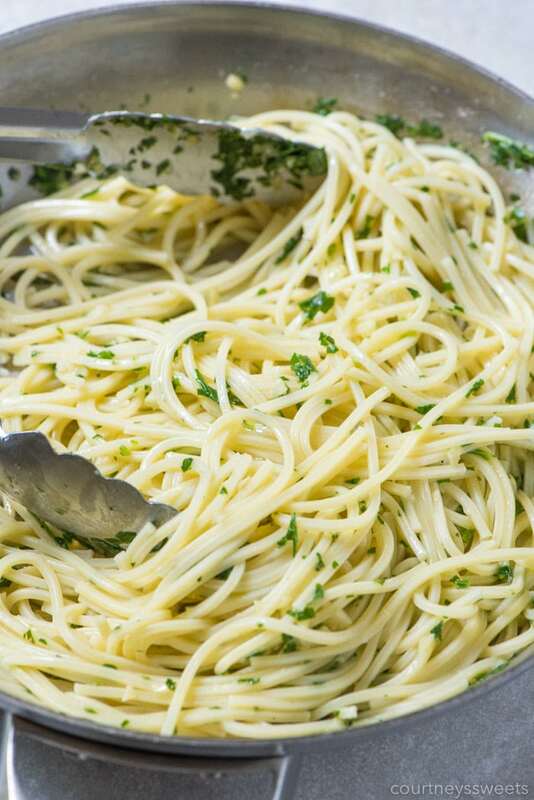 Simply heat up your skillet with olive oil, butter, chopped garlic, and then fresh chopped parsley. 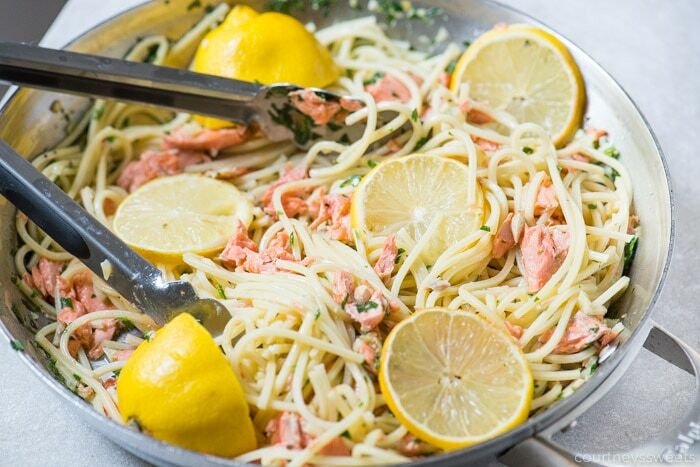 Toss the pasta with the garlic butter sauce and then chop up the Alaska salmon once it’s fully cooked and add into the pasta and toss to fully combine. 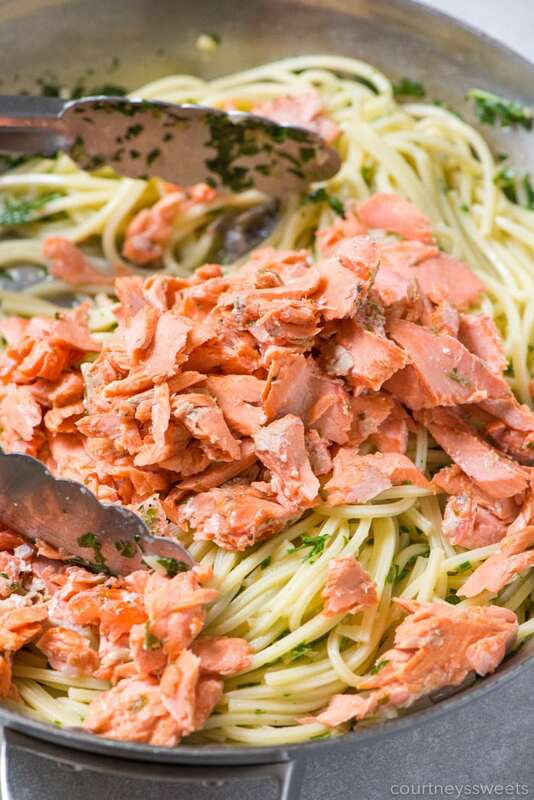 Doesn’t this salmon pasta look delicious?! 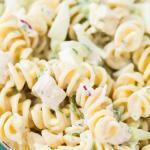 I like to juice another lemon onto the pasta and then give another good toss before serving. 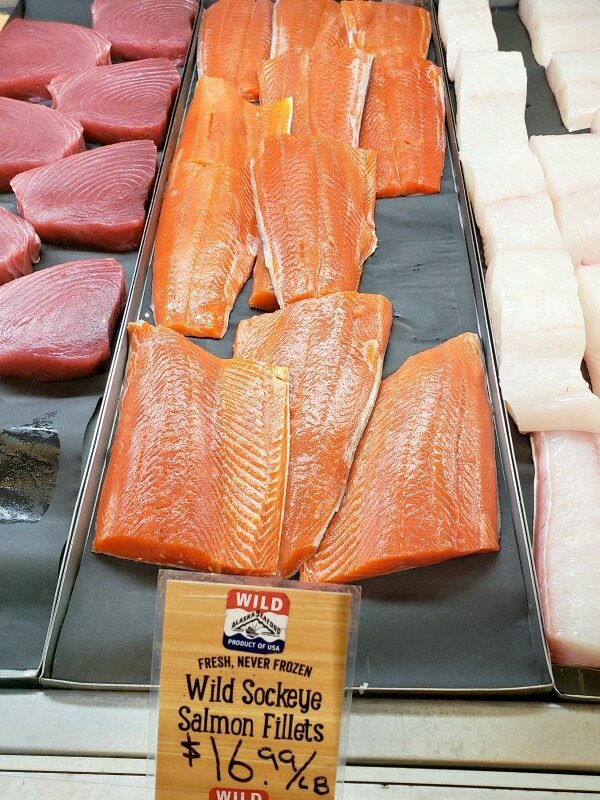 There are 5 different species of wild Alaska salmon that you can find fresh or frozen. Alaska also is a source for pollock, crab, halibut, and even more! Alaska sockeye which is also known as red salmon is one of the most popular salmon species. It has a deep red color with a rich salmon flavor. 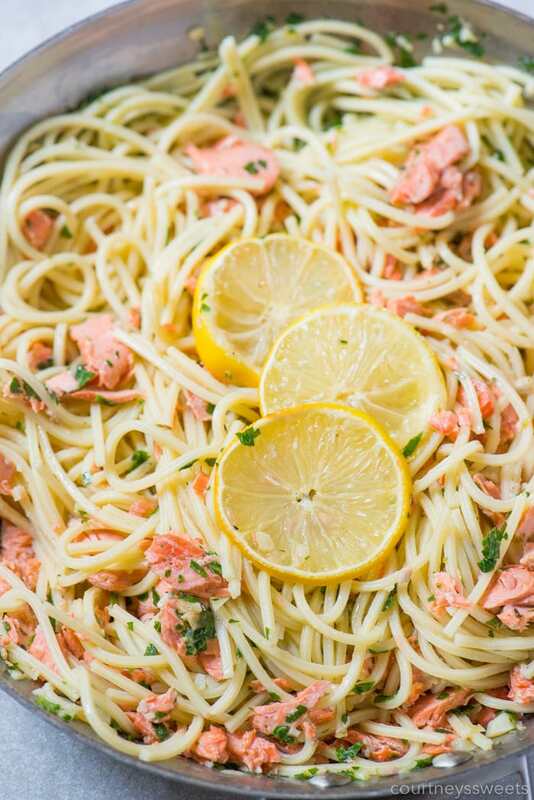 The pasta with lemon garlic pasta really combines with the salmon flavor beautifully. 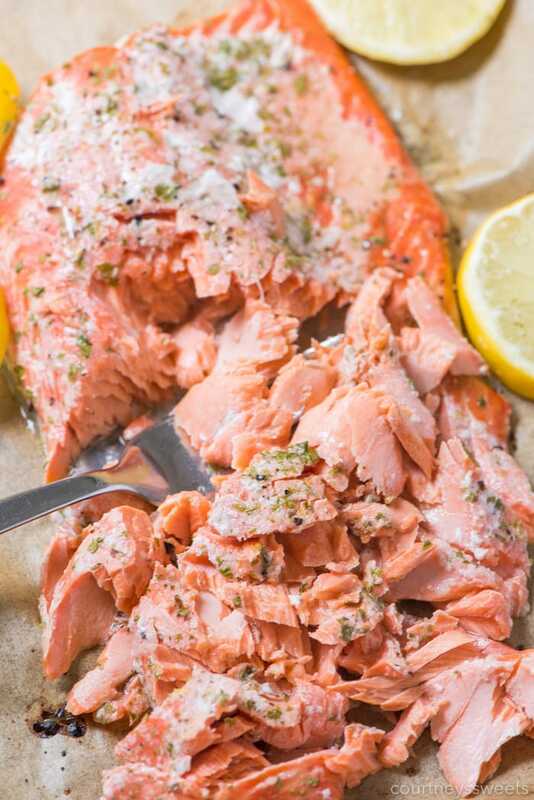 You can cook Alaska sockeye salmon in a variety of ways, it has a firm texture and can withstand most cooking methods like grilling, broiling, baking, sautéing, roasting, poaching, steaming and smoking. We usually find Alaska sockeye salmon fresh from mid-May through mid-September, and you can find it frozen year-round too! It’s so easy to cook delicious seafood at home with Alaska seafood. No need to go to a restaurant (psst most are serving up fresh from the farm). When you make your meals at home you can control all of the ingredients and make a healthy and delicious seafood meal for you family. You can find Alaska seafood sold fresh and frozen year-round for a wide-range of seafood possibilities and healthful options. Find more seafood recipes, cooking techniques, and tips, and to learn why it is important to #AskForAlaska at the seafood counter and in restaurants. The next time you go up to your local seafood counter “Ask for Alaska” to ensure you’re enjoying the best, most sustainable seafood in the world. 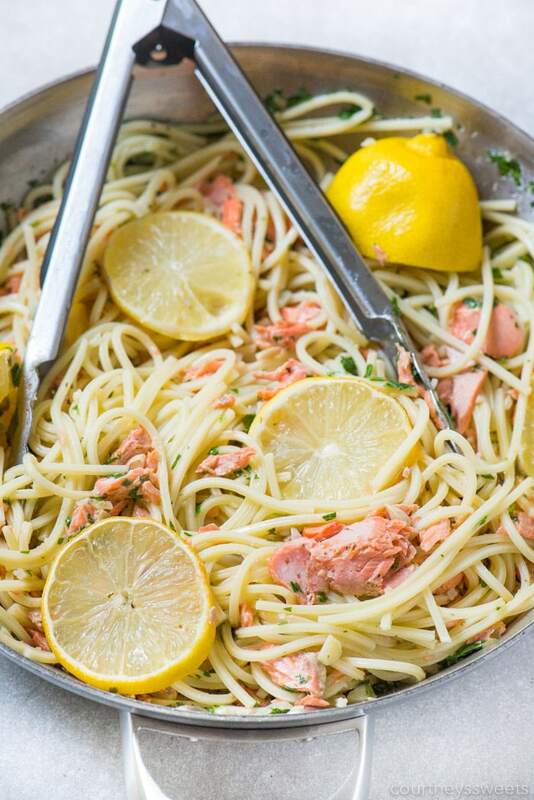 PIN our Salmon with Pasta Recipe to save for later! Watch our video on how to bake salmon and make this delicious lemon garlic butter sauce for tasty dish! 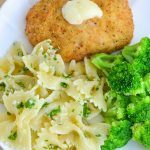 This Salmon Pasta with Lemon Garlic Butter Sauce goes from simple ingredients to a delicious and filling easy family dinner. 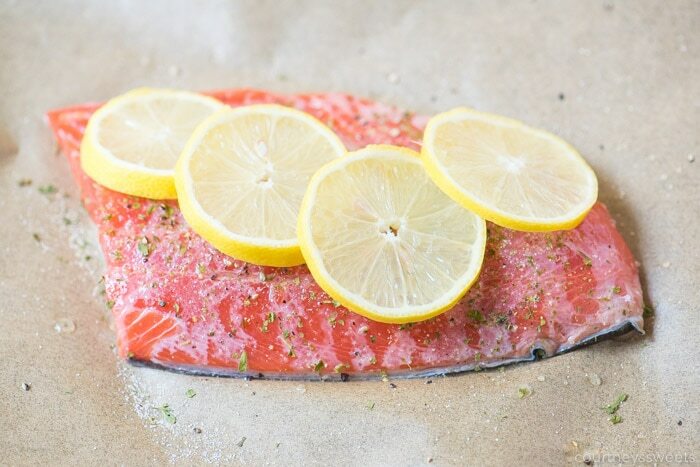 Line baking sheet with parchment for easy cleanup and place salmon onto the parchment. Take one of the lemons and cut in half. Squeeze half of the lemon onto the salmon and slice the other half and reserve. Sprinkle the granulated garlic, parsley, salt, and pepper onto the salmon. 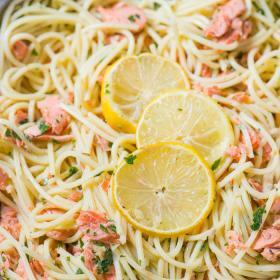 Place the sliced lemon onto the salmon and bake until the internal temperature reaches 145 degrees F.
While the salmon is cooking make the pasta and lemon garlic butter sauce. 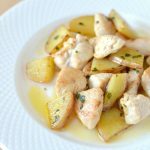 To make the lemon garlic butter sauce heat up a skillet with the olive oil and butter. Add in the chopped garlic and cook on medium-low until the garlic is tender and then remove from the heat. Add in the parsley and then toss in the pasta. Add 1/4 to 1/2 cup of pasta water to the pasta. Juice 1/2 - 1 whole lemon onto the pasta, toss and serve. Serve salmon pasta with extra lemon wedges as garnish, crushed red pepper flakes, and some even like freshly grated parmesan cheese. 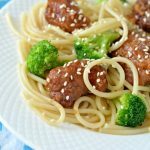 If you would like to control the amount of salt in this recipe we suggest using unsalted butter and seasoning to taste.